Gandhinagar, Dec 25 : A hundred out of the more than 600 Indian fishermen languishing in Pakistani jails were released Friday, an official of a fishermen's organisation said. 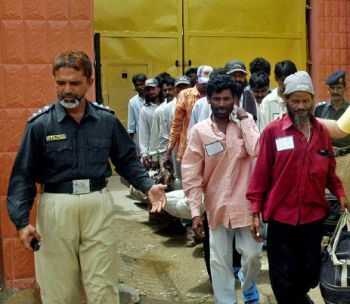 The fishermen, 95 of whom are from Gujarat, were released from Karachi jail, according to a communication received from the Pakistan Peoples Forum, Manish Lodhari, the secretary of the Porbandar-based National Fishworkers Forum (NFF), told IANS. The fishermen will be taken to Wagah border where they will be handed over to the Indian authorities Saturday, he said, adding that there was, however, no information on the release of the boats. Most of the 95 fishermen from Gujarat belong to the coastal areas of the state stretching from Valsad district to Kutch district bordering Pakistan and had been picked up while they were fishing. Lodhari expressed the hope that the released fishermen would get to celebrate the onset of 2010 with their family members. "Let their return home be a new year gift to their families," he said. According to NFF president Hirala Shiyal, after the release of these 100, a total of 528 fishermen are still languishing in Pakistani jails. About 433 boats have also been seized by the Pakistani Maritime Security Agency (PMSA) so far. Meanwhile following a NFF petition filed in the Gujarat High Court, the central government has assured that it will submit a report on the compensation paid in the cases of fishermen detained illegally by Pakistani security agencies. The NFF had moved the high court, seeking it ask the government to ensure release of the fishermen detained in Pakistani prisons as well as compensation to them under the scheme which provides for compensation of Rs. 3 lakh for a person detained, Rs. 5 lakh for confiscation of a small boat and Rs. 10 lakh for confiscation of a big boat.